Lazarus was a Hebrew, of the sect of the Pharisees and, as far as is known, he was the son of Simon the Pharisee, who dwelt in the village of Bethany. He became a friend of our Lord Jesus Christ when He sojourned on earth for the salvation of our race. For when Christ continually conversed with Simon, entering his house and discoursing on the resurrection from the dead, Lazarus was quite pleased with the genuineness of this teaching, and not only he, but also his two sisters, Martha and Mary. As the time of the Savior's Passion drew near, when it was especially necessary to believe in the Mystery of the Resurrection, Jesus was sojourning on the other side of the Jordan. Here, He raised from the dead the daughter of Jairus and the son of the widow. At this time, His friend, Lazarus, contracted a grievous illness and died. Then Jesus, even though He was not present there, said to His disciples, Our friend Lazarus sleepeth; but I go, that I may awake him out of sleep (John 11:11), and again a little later, Lazarus is dead. (See John 11:14.) Then Jesus left the Jordan and went to Bethany, which was about fifteen stadia (approximately 2 miles) away from Jerusalem. Martha, the sister of Lazarus, went to meet Him and said, Lord, if thou hadst been here, my brother had not died. But I know, that even now, whatsoever thou wilt ask of God, God will give it thee. (John 11:21-22). Jesus asked the crowd, Where have ye laid him? (John 11:34.) Immediately everyone went to the tomb. As the stone was removed, Martha said, Lord, by this time he stinketh: for he hath been dead four days. (John 11:39). He shed tears for the one lying there, and He cried out with a loud voice, Lazarus, come forth (John 11:43). At once, he who was dead came forth, was unbound, and set out for home amidst great rejoicing and thanksgiving. This strange wonder roused the Hebrew people to malice, and they were infuriated with Christ. But Jesus once more fled and escaped. The high priests determined to kill Lazarus, because many who saw him were won over to Christ. Since Lazarus knew what they were thinking, he sailed away to Cyprus. He dwelt there and was later elevated by the Holy Apostles to be Archbishop of Citium (present-day Larnaka). He was beloved by God, conducting himself most nobly as an archpastor, performing many miracles. Thirty years after his resurrection, in 63 A.D., he died once more and was buried in Citium. It is said that after his return to life Lazarus ate only meals having some sweetness, because of the bitter taste in his mouth from having been dead. Also, it is related that the All-Holy Mother of God sewed his omophorion and cuffs with her own hands and presented them to him as a gift. Furthermore, it is told that Lazarus never laughed more than once after being raised from the dead, and that was when he observed someone stealing a clay vessel. At that point he smiled and said, "Clay stealing clay." Lazarus said nothing concerning those in Hades, either because he was not permitted to behold anything, or he was directed to be silent about what he had seen. 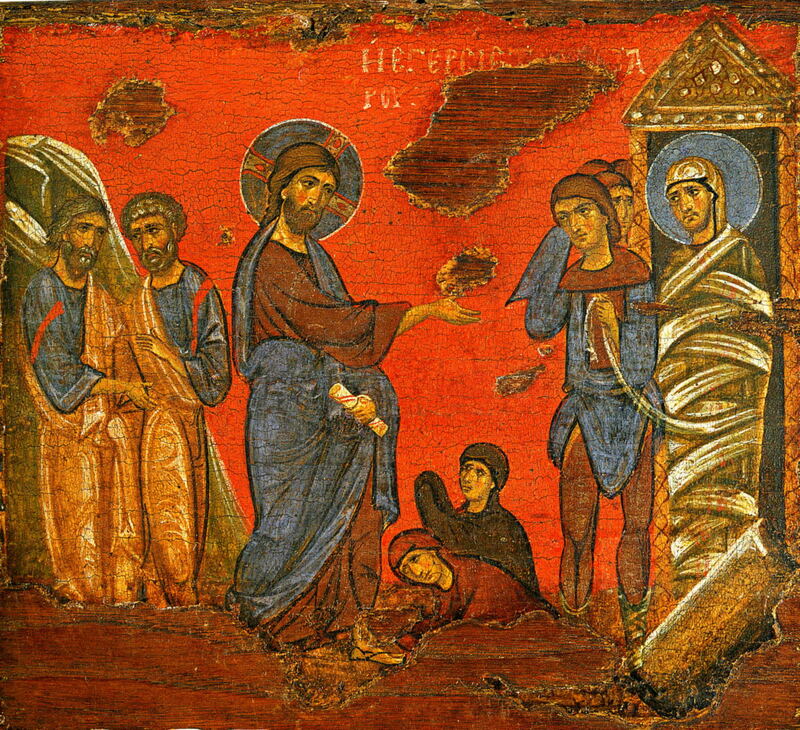 The resurrection of Lazarus is appointed to be celebrated on this present day, after the forty-day purifying Fast, because our Holy and God-bearing Fathers, especially the Holy Apostles, found this miracle to be the beginning and cause of the fury of the Jews against Christ, when He was about to give Himself over to His Holy Sufferings. For this reason they placed this extraordinary and wonderful event here. In addition, the placement of this feast by the Holy Fathers serves as a necessary rest" and "transition" between the rigors of the Fast and the awesome and saving events of Holy Week. For in truth, yesterday evening's Vespers not only ended the Holy Forty Days, but also ushered us into a joyous resurrectional prelude that will eventually lead to our Savior's Passion. St. John the Theologian alone records the raising of Lazarus, since the other Evangelists omitted it—perhaps because Lazarus was still living and able to be seen. It is said that the rest of the Gospel of John was written about the eternal begottenness of Christ, the other Evangelists including nothing about this. It is desired to believe that Christ is both the Son of God and God, that He is risen, and that there will be a resurrection of the dead. And because of the raising of Lazarus, this is especially to be believed since his resurrection is a confirmation of the universal resurrection of man. Therefore, from this event, every man who has already died is said to be a "Lazarus," and the burial garment is called a Lazaroma, for the word alludes to the remembrance of the first Lazarus. For if Lazarus was raised by the word of Christ and came back to life again, so all men, even if they have died, will rise at the last trumpet and live eternally.